Shopping for A Lawn Greeting Card Display? Q. How do I shop for a Lawn Greeting Card? Q. What occasions can you help me celebrate? A. We can help you celebrate a wide variety of occasions, including birthdays, holidays, new babies, anniversaries, graduations and many more. If you celebrate it, we can help. 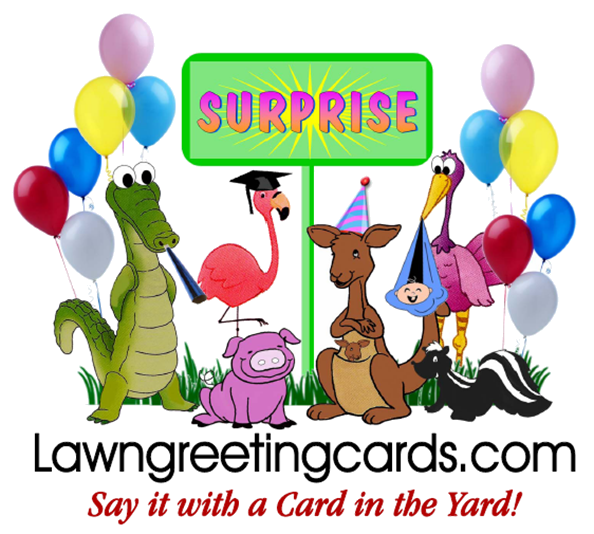 Please see our Occasions (Birth Announcements, Birthdays or Lawn Critters) to pick your Lawn Greeting Card surprise. Q. What is your most common occasion celebrated? A. Birthdays are our most popular occasions, but we can help you celebrate any special day. We celebrate many occasions besides birthdays, including new babies, anniversaries, retirements, marriage proposals and graduations. Please see our occasions (Birth Announcements, Birthdays, Lawn Critters) to pick your Lawn Greeting Card Surprise. Q. Can I create my own custom package? A. Of course. To do so, please call us at 866-609-7773. Diane will help you customize your order! Q. Is a sign included with my display? A. Yes, the message sign is dependent on the type of display. Our typical sign is a 3 1/2 ' X 2 ' Yard Card Sign (sandwich board with 9 letters across including spaces and 6 lines down) that comes with the critters. Q. What can my sign say? A. During the ordering process, you will be able to choose from many different messages (Sayings), or write your own phrase. Q. How can I enhance my display? A. We have several ways that you can enhance your display, including adding additional decorations, laminated keepsakes, additional days, or a longer message. During the ordering process, you will be asked if you would like to add something to your display. Q. How far in advance should I plan my Lawn Greeting Card Surprise? A. Surprises can be ordered days in advance, same-day or for next-day delivery. Q. Is delivery still available on or near busy holidays or special events? A. Yes. For more information, please call us at 866-609-7773 to speak with us. Q. Do you deliver in bad weather? Q. Do you deliver every day of the week? A. Please READ our Terms and Conditions regarding our cancellation policy. Our phones are open 24 Hours a day to take orders. If you reach our voice mail, please leave a message and we will return your call promptly. We may be busy with other customers. We generally deliver and pick up the displays between midnight and 6:00 a.m. Other delivery times can be arranged. We pick up the displays after 24 hours or 5 days for Birth Announcements. Additional days can be added for an extra charge based on availability. We serve the greater Chicago metropolitan and 7-county area, as well as parts of Wisconsin and Indiana. We strive to make sure all our customers are satisfied by guaranteeing the surprise by 6 a.m. and also by making ourselves available to you for any questions, comments or concerns.